Am I the only former Smiths fan who was bitterly disappointed with Morrissey’s debut album Viva Hate? Indeed am I the only individual on the planet who believes the man’s solo career peaked with Suedehead? Sometimes I think so, when I witness the reverence the old goat is still held in by many people. Although I often feel the ardour is somewhat hopefully messianic; folks desperately wishing he may still come up with the goods despite all the evidence to the contrary. For it could be argued; Morrissey only really enjoyed a recent lucrative return to mainstream once he began incorporating significant numbers of Smiths’ songs into his concerts. But that is perhaps a discussion for another time. Following the acrimonious demise of The Smiths, whilst Johnny Marr was content to patter along playing Ronson to a series of Bowies, Steven swiftly got the old solo career thing on the tracks, releasing his first single (the aforementioned Suedehead) in February 1988. The much anticipated debut album Viva Hate arrived the following month. And what a dispiriting set it proved to be, with perhaps just three worthwhile songs on it: Everyday is Like Sunday, Margaret on the Guillotine plus that debut single. Of the rest Late Night, Maudlin Street plodded on without getting anywhere, Break up the Family was pleasant but dull, whilst Bengali in Platforms saw Morrissey lyrically flirting around the fringes of racism (something he would do more than once in the coming years). 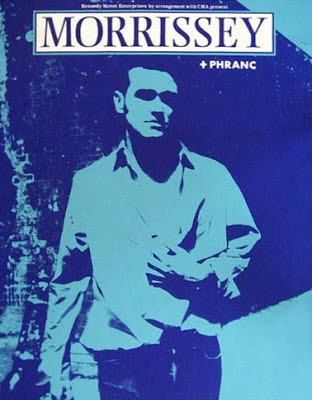 By the time of 1991’s Kill Uncle album, Morrissey had succeeded in producing a clutch of noteworthy yet hardly essential singles (gathered together on the Bona Drag compilation), but had reached a point in his career where the titles of his songs were becoming more stimulating than the songs themselves. Interesting Drug and International Playboys were quality though. The Spring of 1991 witnessed Morrissey embark upon his first post-Smiths tour, ostensibly to promote the Kill Uncle album; this Dundee gig being only his third ever solo performance on UK soil following earlier visits to Wolverhampton and Aberdeen. I went along with my Brother who, after spending the first 30 years of his life with musical interests which barely stretched beyond the Beatles’ red album, had suddenly and inexplicably fallen completely under Morrissey’s spell. He hadn’t cared much for The Smiths, which made his almost religious conversion all the more dramatic. Support for the evening was a female solo singer/songwriter who went by the name of Phranc: she was introduced as Morrissey’s “favourite American Jewish Lesbian Folk singer”, or some such. Phranc turned out to be a remarkably beautiful lady, looking not unlike kd lang without the fearsome jaw-line. I don’t recall too much about her performance other than I did not find myself wishing she would hurry up and finish, as I tended to do with most support acts. Morrissey’s set opened with Interesting Drug, with another hit single International Playboys coming along not far behind. But thereafter, things became a bit more challenging for a casual-ish fan like myself. The latest single Sing Your Life I knew, but much of the rest were new to me and just sounded like so much mediocre fodder, particularly the dreadful dirge Asian Rut. Proceedings were not helped by the fact Morrissey’s voice was clearly not quite up to the job this particular evening. Consequently, just after a slowed tempo rendition of The Jam’s That’s Entertainment the band wandered off stage after less than an hour to general bemusement. I think we were told over the PA system that Morrissey’s sore throat had flared up, but that he would return if we were patient. Well, patient we were, and were rewarded with a lively performance of the old T Rex tune Cosmic Dancer. He should probably have called it quits at that point, but evidently not wishing to disappoint us, had a bash at one more. The singer’s voice broke down completely during this ‘un, and he mouthed sorry before wandering offstage leaving the band to finish the song themselves. And thus did the show end, with not even a whimper far less a bang. I think Morrissey had been on stage for less than an hour, and I felt wee bit short-changed by the whole business. Not that the truncated set appeared to have bothered the Morrissey faithful, for I have never seen such a frenetic scrum around a concert memorabilia stall, as tenners and twenties changed hands like a bonds on a Wall Street floor.